IPU CET Admit Card 2020: Only those who have correctly filled and submitted the application form will be able to download the IPU CET 2020 admit card. The admit card will be issued on the official website of IP university in the 2nd week of May 2020. It is mandatory for each appearing candidate to download the IPU CET admit card 2020. Candidates can download the admit card by using candidates log-in ID and password, online. GGSIPU will issue the admit card online, on or before 5 days of the date of the CET 2020. Please note that all appearing Candidates are required to carry two printouts of the admit card at the time of IPU CET. One copy of the admit card must be retained by the candidate after getting it signed by the Invigilator. The second copy should be handed over to the Invigilator for University records. The IPU CET is one of the prestigious entrance exams conducted in the country. 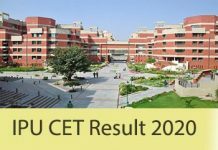 After the application form filling is over, the admit card of IPU CET 2020 will be issued. It will be issued by the University to be used as proof of application for the candidature of the candidates at the time of counselling/ admission. 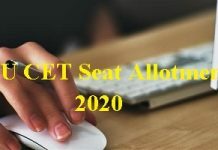 The Hall Ticket of IPU CET 2020 can be downloaded in 2nd week of May 2020. 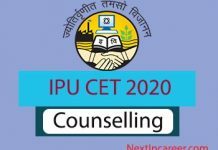 How To Download the IPU CET Admit Card 2020? Visit the official website of IPU. Or click on the Admit card link. Login to the candidate portal using the ID and password. Go to ‘Course Application tab’ and click on ‘View application and download admit card’ tab. The “Admit Card” option will display on the screen. Check all the details and take a print out of the Admit card. After you see the IPU CET 2020 Hall Ticket/ Admit card, you must check for these details on it. The IPU CET Hall Ticket 2020 will be available online, on or before 5 days of the date of the CET. No candidate will be allowed to enter the Examination Hall without the valid IPU CET Admit Card 2020 which will be issued by the University. All appearing candidates have to carry two printouts of the admit card at the time of the exam. One copy of the admit card has to e retained by the candidate after getting it signed by the Invigilator. The second copy has to be handed over to the Invigilator for University records. Both the copies must have a passport sized photograph of the candidate is pasted on it. Candidates are advised to keep two copies of the photograph uploaded at the time of form filling handy for this purpose for each IPU CET applied for. Request for issue of duplicate Admit Card will not be entertained after the IPU Common Entrance Test 2020. Candidates will not be allowed to claim the non-receipt of the admit card on the basis that they have filled the application form after the IPU CET is over. In case of non-receipt of Admit Card, the candidate may contact Office of Controller of Examinations (Operations) at GGSIP University, Sector 16C, Dwarka, New Delhi 110078 at least 5 days before the scheduled commencement of respective CET. The application n this regard must be supported by a copy of the printed version of the application form and proof of payment of the requisite fee for the CET. Without the submission of these two documents, no application in regard to non-receipt of admit cards will be entertained, the application in this regard will be deemed incomplete and rejected without intimation to the applicant. If you have any queries or questions or suggestions, do leave a comment in the comments section below! Previous articleWBJEE 2019 Result – Date announced!